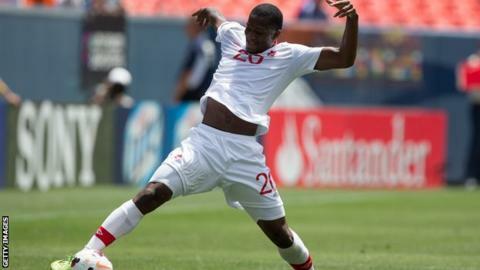 West Ham have signed Canada defender Doneil Henry from Cypriot side Apollon Limassol. The 21-year-old, who played 92 times for MLS side Toronto FC, moves to Upton Park on a long-term contract for an undisclosed fee. The 6ft 2in (1.88m) centre-back has spent two periods training with the Hammers in recent months. He was recommended to manager Sam Allardyce by former Toronto head coach and ex-Blackburn player Ryan Nelsen. "It feels good to be given the opportunity to come and train and see what it's like to be part of a Premier League team and I just want to get started and get into the team real soon," said Henry, who has 14 international caps. "I love a tackle and I just want to defend hard. I take pride in my clean sheets with the backline and with the keeper, so if we can just do that, it's job completed." Allardyce, who managed Nelsen at Ewood Park, hopes Henry can make his West Ham debut before the end of this season. "We have invested in him for the near future, so we do hope he can make some sort of appearance this season if he settles in and does as well as Ryan thinks he will," Allardyce said. "If not, we hope he is certainly one for the future."